An Amazing Weekend Visiting Perth | We flew in from Canberra Perth with the Qantas airline. We then took the shuttle bus that led us directly to the hotel. We stayed at Crown Perth. In the hotel there were many young people and there was night partying until the wee hours of the morning. It was very fun and crazy. After enjoying the Crown Promenade Perth in the morning, through the reception of the hotel we rented a car. We headed towards the North of Perth. We spent all day in route to reach Kalbarry Town. We stayed at the campsite Kalbarry Anchorage Caravan Park. In the morning, we visited the village which is at the mouth of the Murchison River. This estuary has a nice beach, protected from the waves by a barrier of sand. You can rent canoes and motor boats in the water. It looked very amazing! At 8:45 am they feed the pelicans on the beach. Then we went to the coastal part of Kalbarry N.P. It is a road out of the village and runs along the coast, past the red cliffs with coves. The interesting thing is we got to see Red Bluff, Port Alhy Gorge, Eagle Gorge, Island Rock and Natural Bridge. Then we headed to the National Park where the Murchison River was. In this area there are no paved roads and tracks go by yellow desert sand for 27 kms. Upon reaching the entrance, there is a booth with maps and brochures. With the rental car we could not go by track, but as it is the only way for us to get there, we were very careful. 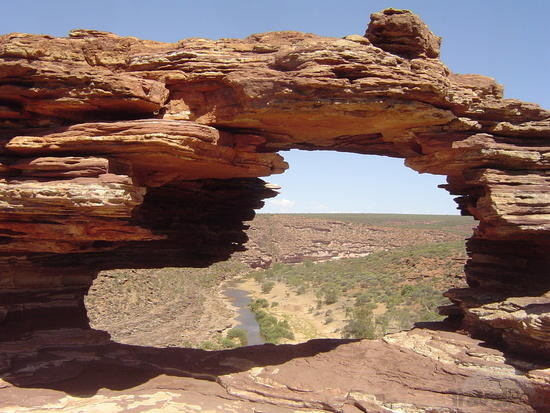 Here we could see the Nature’s Window, a window into the rock. It was very spectacular. The road is on a river bank and moves through the meandering route. You can swim if you want to but we were advised not to because it could be very cold. The last part of the trail crosses desert sand to get to the starting point. We finished the tour and returned to the main road to continue heading north. It got dark and we stopped for the night at a campsite called Nanga Bay Resort. In Australia you have to be careful driving at night. The animals are more active at night, when temperatures are not as stifling. As the sun sets, crossing the road spontaneously, and we must be careful not to run them down and have an accident. We saw plenty of kangaroos and emus crossing in front of us. As it was our last day in Australia, we toured the city peacefully. We visited the Art Gallery with a very good collection of Aboriginal paintings. Finally, we did some shopping at the Mall. We walked through Kings Park with its Carillon. We visited the Western Australia Museum which is highly recommended. It has all kinds of Australian animals and fossil. There is also an exhibition of Aboriginal life and customs. We could not leave Australia without going to a restaurant to try kangaroo meat, so for the last night we met in a pub . We enjoyed the very fibrous flesh with flavor similar to beef. Although there are many kangaroos in Australia, people are not used to eating meat, except the natives. All in all it was an amazing trip and Perth is worth revisiting!